Remember the Days of Flocked Wallpaper? Well, flocked paper is back in style. Here’s one that some clients of mine are considering. They have a very contemporary decorating style, with lots of mirrored furniture and wacky glass chandeliers. This paper will go on one wall of the dining room, and will definately be the main focus! I noticed on the site for Total Wallcovering, that they make a note when a particular paper is “environmentally-friendly.” This is a concern to many people today, so I’m glad to see retailers and manufacturers making customers aware. 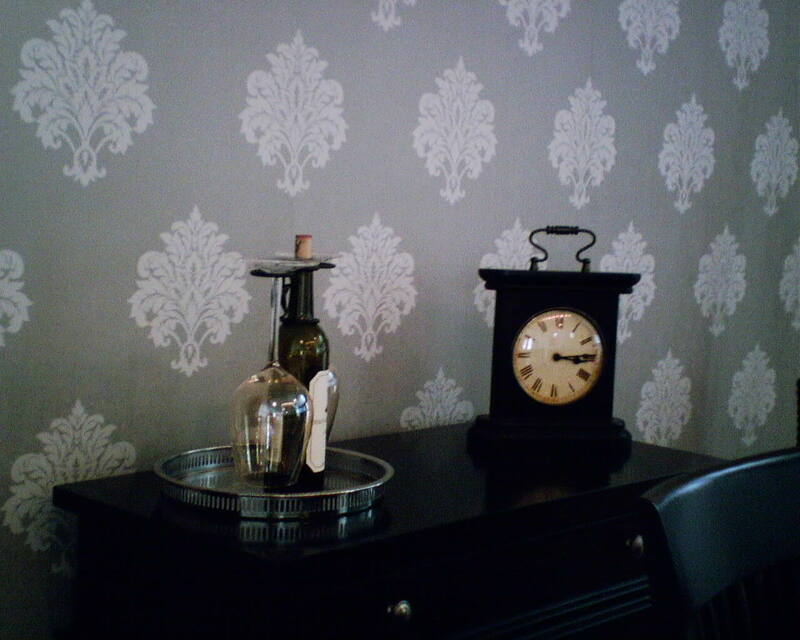 Total Wallcovering is an on-line resource for many types of wallpapers. Here’s a fairly traditional trellis pattern I installed in a newly-redone bathroom, with dark standard cabinets in a home with traditional taste and lots of antiques. In fact, parts of the pattern design looked very similar to the handle hardware on the bedroom dresser. I know, it’s a small, dark photo of a bahtroom without the mirror or other pretty elements. But the finished room looked great, and the homeowners LOVED it. 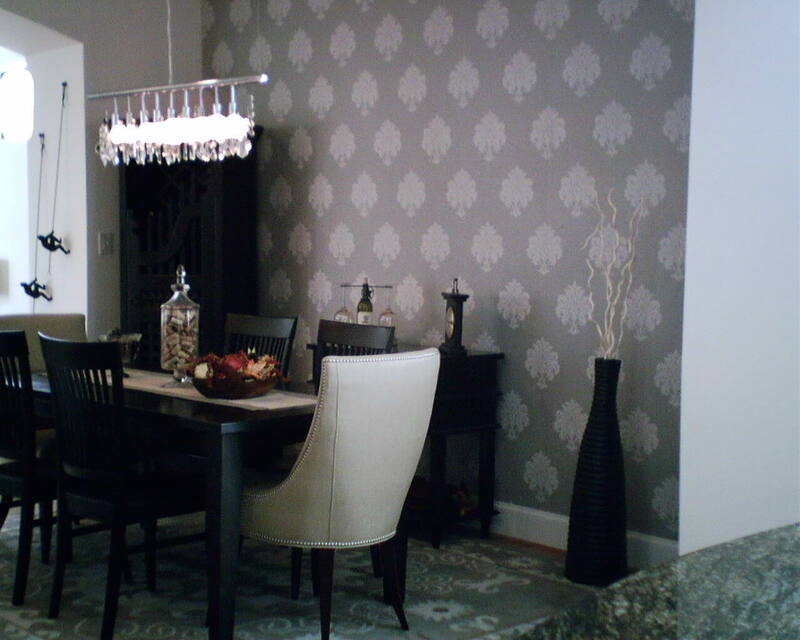 Most wallpapers absorb moisture from the paste, and then shrink a little when they dry. This means that, especially on dark papers, there’s a pretty darned good chance that you will see white at the seams – from either the white edges of the wallpaper, or the wall behind it. Some manufacturers circumvent this by printing their dark papers on colored backing / stock. But most of the time, the backing is white, and so we paperhangers have to get resourceful. There are as many different ways to color the ends of paper as there are paperhangers, but here is a technique I like. I keep the bolts rolled up tightly, as they came from the factory. This allows the paint to be put on the cut ends, where it will be wicked into the paper, but not allow it to get onto the surface of the paper. Water color, or acrylic, is used, because the water-based pigment will soak into the paper, but can be wiped off the surface of (most) wallpapers, if it should get into contact with it. Oil-based inks are not a good idea. Once the pigment soaks in and dries, it’s there for the duration, with little worries of re-wetting and coming out of the paper. This ads just enough color to disguise seams that might shrink just a hair as the paper dries. For situations where there is wider gapping, and the white wall beneath shows, I have other tricks up my sleeve. But that’s another blog…. Very informative video of how grasscloth wallcovering comes to be. The only thing they didn’t show is cutting the material to 36″ widths. 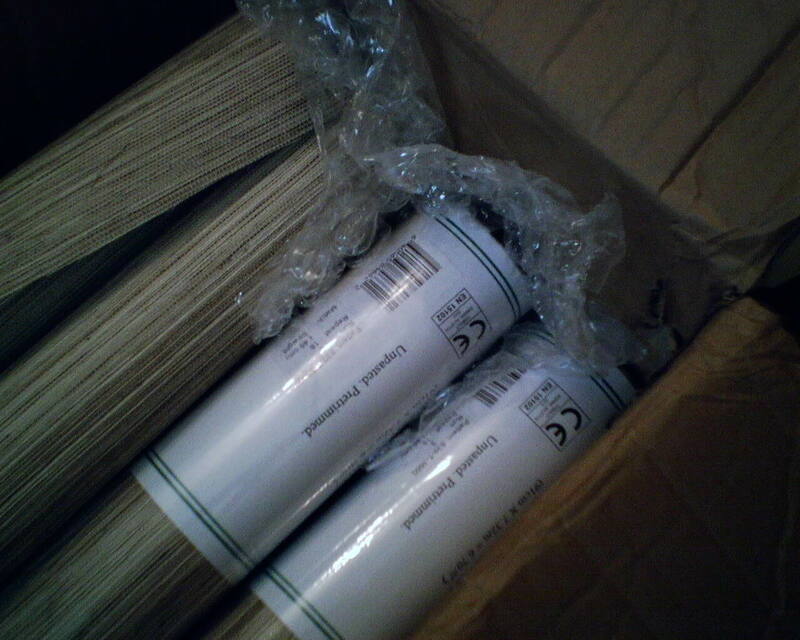 Finally – Bubble Wrap Around the Ends of Wallpaper Rolls! You can’t see it in the photo, but the shipping box is farily banged up. But the edges of the wallpaper are just fine, because – for once – the warehouse guys put bubble wrap around the ends of the rolls before sending the package on it’s way. Where I worked today and will finish tomorrow, the homeowners had an existing bathroom redone and updated – new tile, tub, cabinets, granite countertops, lighting, towel bars, etc., and had the old mirror and medicine cabinet removed. 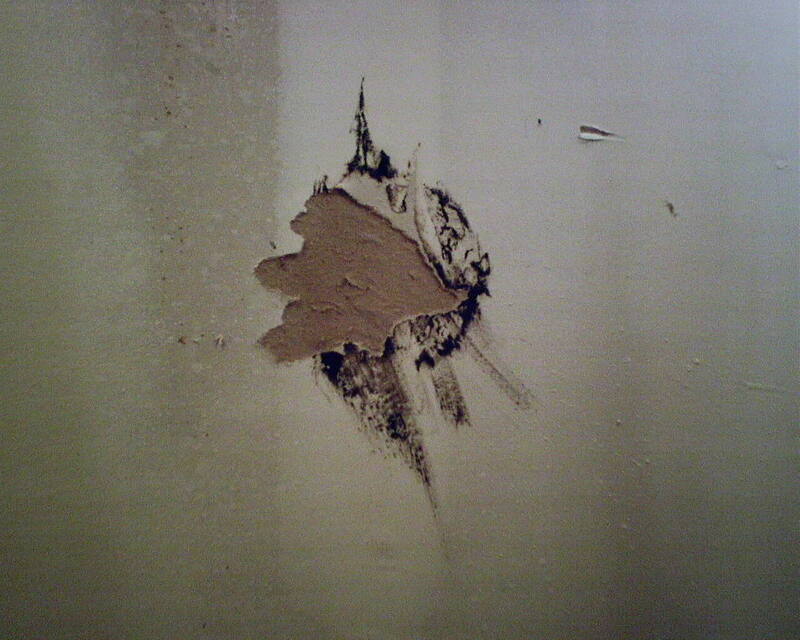 In photo #1, the mirror has been pulled off the wall, leaving behind the black tar that holds it against the wall. Glass guys are great at tearing mirrors off the wall, ripping up the Sheetrock, and leaving black goo everywhere. But they never bother to fix the mess, forcing the homeowner to hire someone else to do repairs. 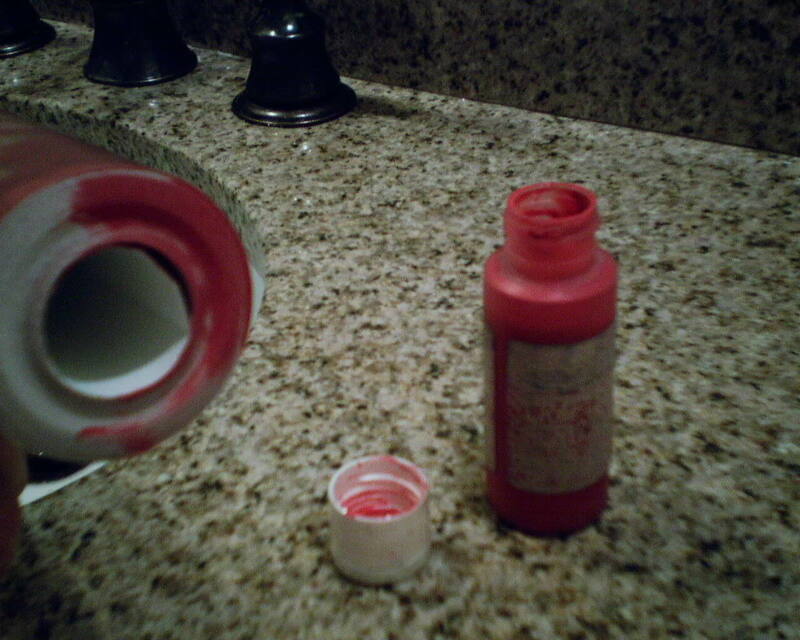 Black tar is villainous, because it will bleed through wallpaper (and paint, too). So it need careful attention and intelligent treatment before the new paper can go up. In the second and third pictures, you can see some of the “repairs” the workmen did to the walls, including the area where they yanked out the medicine cabinet and patched in some new Sheetrock. Hey, guys, didn’t your boss tell you that you’re supposed to SAND the mud SMOOTH once it’s dry? 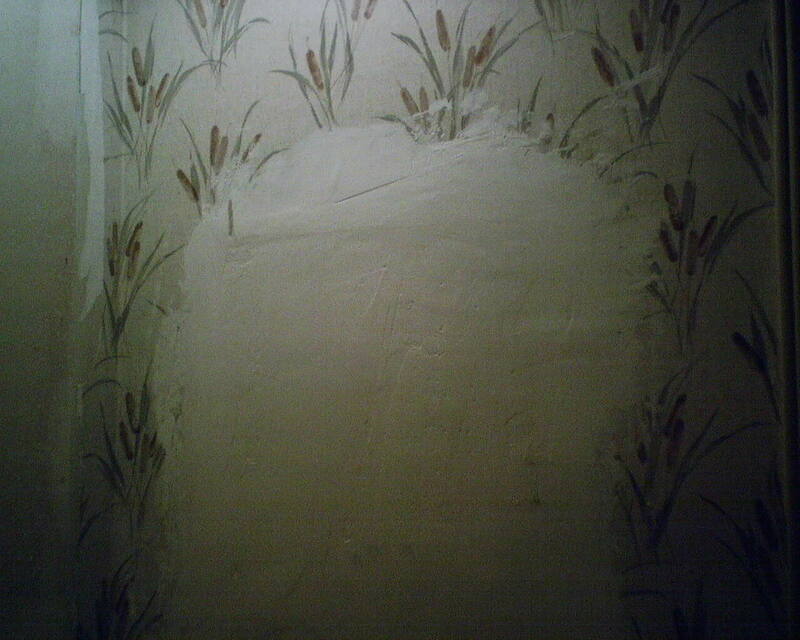 You’re also supposed to REMOVE THE OLD WALLPAPER before you do your patching. The fourth shot, OK, this is a little petty, but, gee, guys, PUT ALL FOUR SCREWS in the switch plate cover. And if you drop one or lose one, you should have a stash of extras in your tool box. 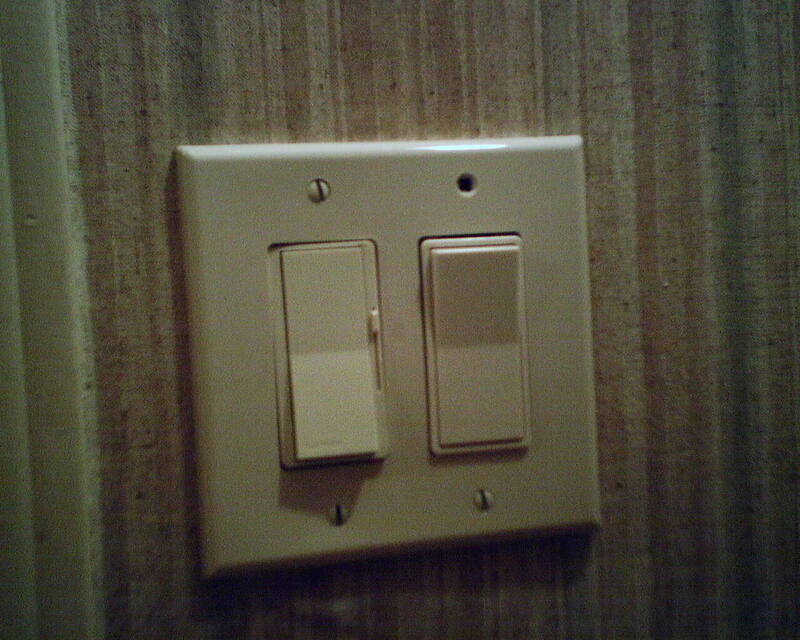 At least the switches line up properly inside the cover, and it all sits flush with the wall, and is plumb, too. Last photo – can you see that the previous paper hanger put the paper over the textured wall? This allows bumps to show through the paper. And I didn’t take a picture of the 5/8″ gap between the granite backsplash and the wall. A little caulk, or even some shims or wood spacers, would have filled this in. I hate seeing work like this, because I feel like the contractor and workmen are either lazy or unskilled or simply don’t give a flip, and took advantage of the homeowners. The poor homeowners don’t have a clue what good work is supposed to look like, so they don’t know that they’ve been left with a mess. 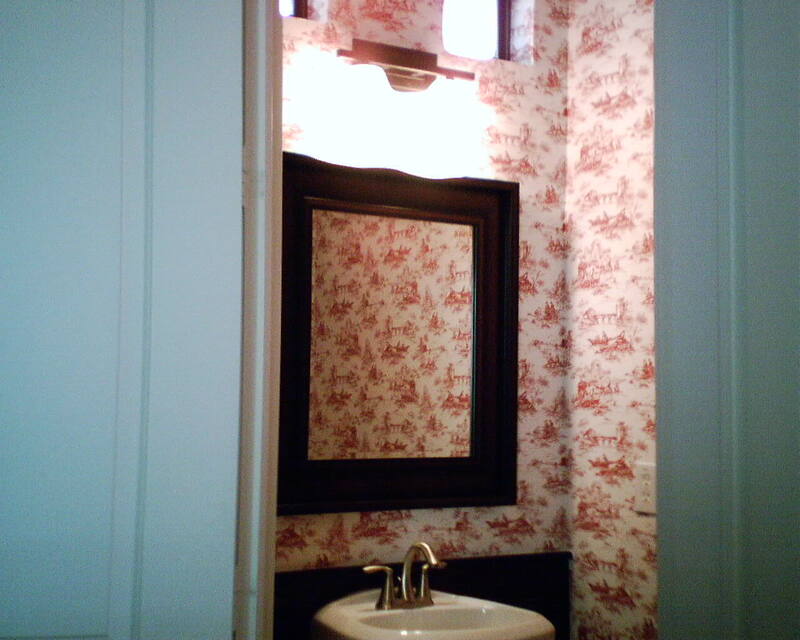 Regarding the poorly floated areas, often the workmen tell the homeowner, “The wallpaper will cover it.” NOT TRUE! 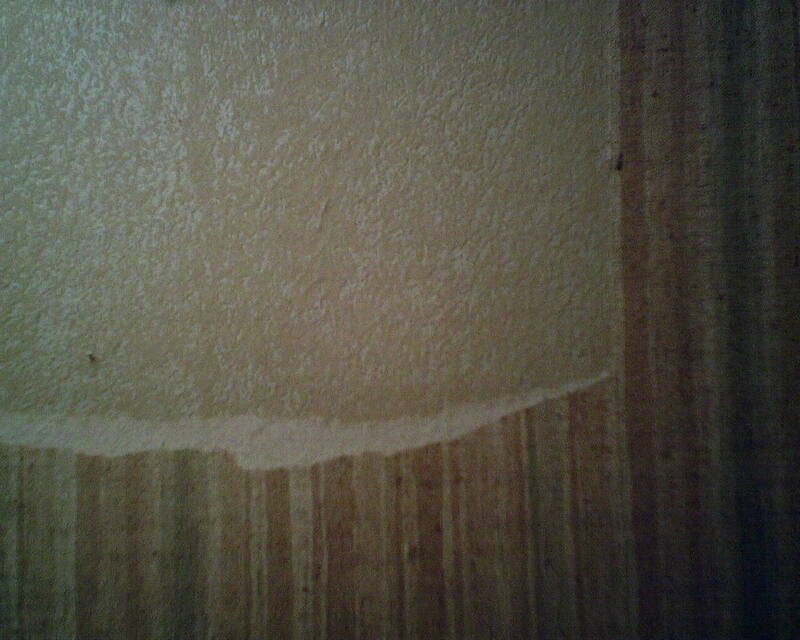 Wallpaper doesn’t hide bumps and gouges… Wallpaper ACCENTUATES these defects. Then again, with the two new recessed can lights, each fitted with a 15 watt bulb – yes, a total of THIRTY WATTS for the entire bathroom – there’s little chance the homeowners will ever see ANYthing in THIS bathroom! So far, Day 1, this job has been a lot more work than I expected (or bid for). 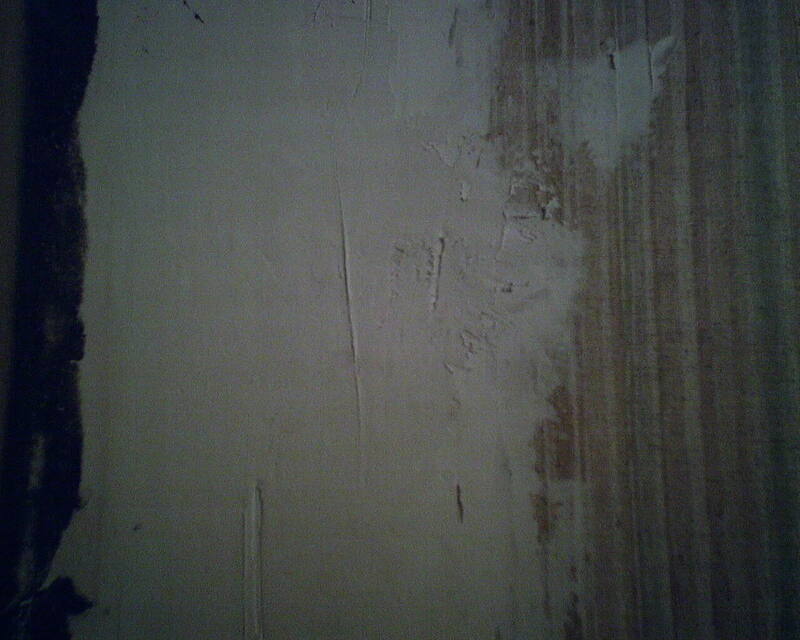 I had to remove the old wallpaper, and then skim-float the walls to make a smooth base for the new paper. I also had to skim float over the crappily-patched areas done by the contractor, as well as dig out the tar behind the mirror and refloat that wall. It’s going well, though, and once I’m done, the walls will be nice and smooth and sound and stain-free, providing a super base for the new wallpaper. Here are a few better shots of the dining room I did two weeks ago. It all looks so much better with furniture in place. This is a good example of the type of pattern I am hanging a lot of these days – a traditional pattern, but done in an updated way – huge scale, trendy colors, sassy tone. 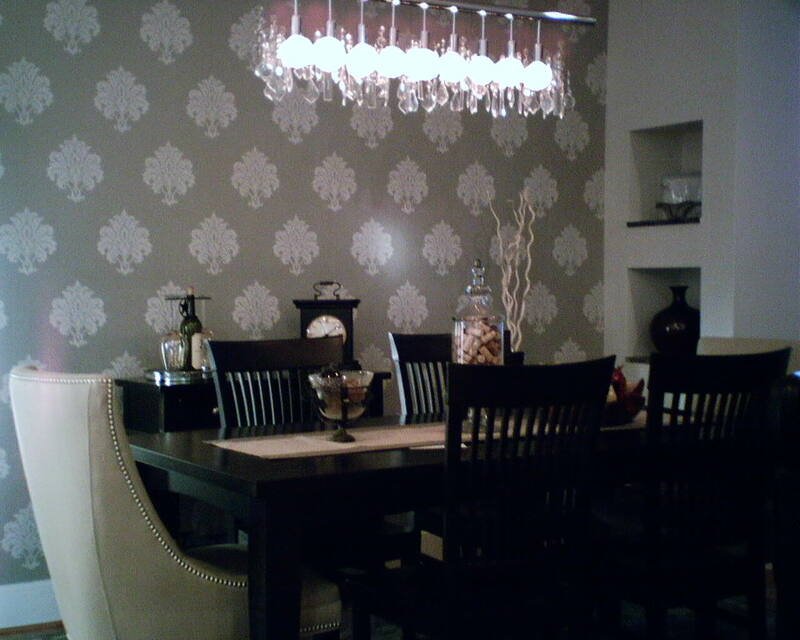 The décor in this home is an understated contemporary look, and I think the wallpaper fits quite well. What’s interesting is that this house is fairly contemporary in style, and so are the fixtures in the bathroom. Yet the traditional pattern fits right in. I wish the photo were better. But, gee, in a small bathroom, you just can’t back up far enough to get a full shot. But you get the idea! She said yes, and then I finally began to draw a little more information out of her. But first I couldn’t help but start off with a little lecture – a gentle lecture. “You know, you would do better to start off by introducing yourself, and then explaining quickly what you are wanting to know and why. 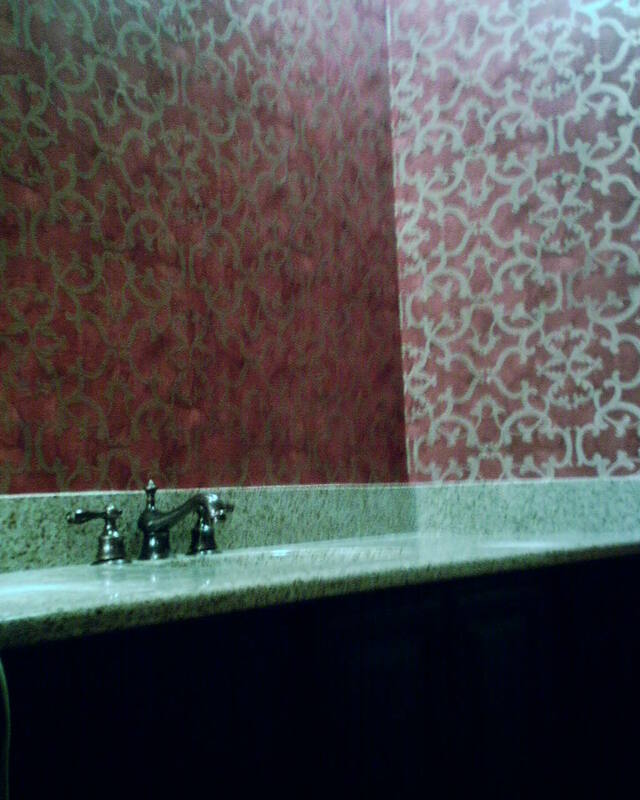 I don’t sell wallpaper, but I can help you if you want to know about trends and styles. And I can guarantee that if you call Lowe’s and simply ask, “What are your three top selling wallpapers?” that the operator won’t have a clue what you’re talking about, and even if you get to the wallpaper department, which also sells window blinds and floor tiles, it’s not likely that there would be anyone there who could answer such a question. I wanted the young lady to know that an introduction and a brief explanation of her project would be a better way to get the information she seeks. So I got her to talk about her project a little bit, some sort of art or design class (she’s interested in design types, not types of material used in constructing, wallpaper), and then I was able to answer her question, and she hung up happy. For No. 3, I thought a little, then said – Retro Patterns, such as the 1960’s & ’70’s. You are currently browsing the Wallpaperlady's Blog blog archives for October, 2012.